Quantifiers: we use different quantifiers a few many, a little, much with countable and uncountable nouns. For small quantities of countable nouns, we use a few: A few students. For small quantities of uncountable nouns, we use a little: A little information. For large quantities of uncountable nouns in questions and negative sentences, we use much: Do you have much money? / There isn’t much information. We use a lot of, or lots of for large quantities of countabble ans uncountable nouns: We had a lot of fun. I have lots of friends. Does she have lots of money? If there is no noun after the quantifier, we use a lot without of: I like him a lot. We can use other words to refer to quantity of an uncountable noun, e.g.a bit of chocolate, an amount of money, and a drop of water. Prepositions of time: at, on and in indicate when something happens. We use at for times of day: at 6.15 at breakfast and expressions such as at night, at chrismas at the weekend. We use on for days and dates: on tuesday, on the 2nd day of the week, on december 25th. We use in for years, seasons, months, parts of the day, long periods: in 2009, in summer, in may, in the morning, in the holidays. Prepositions of place: at, on and in indicate where someone or something is. We use at for a point: at the train station and expressions such as at the bottom, at the front. At college. We us on for surfaces: on the table, on the wall, and for lines: on the border, on the coast. We use in for someone or something in space: in madrid, in the sea, in a house, in america. Frequency adverbs: we use frequency adverbs to say how often something happens. We can use a word, sometimes, always or a phrase like most afternoons or every night. We usually put one-word frequency adverbs and hardly ever) before the main verb: we sometimes watch a film in the evening, i don’t usually go out until 8 o’clock, it hardly ever rains in july? With am, is, are, was or were, etc. They come after the verb: they are always late! Nowadays my grandmother is always ill. They also come after auxiliary and modal verbs: it has often happened. I can never understand him. If we want to, we can put usually, often, sometimes and occasionally at the beginning or end of a sentence: occasionally we eat in the garden. I feel tered soetimes. We cannot put always or never at the beginning or end of a sentence. We put phrases at the beginning or end: I have piano lessons once a week. Most evenings i stay at home. We can form questions using: How often do you, do you ever, do you always, etc. How often do you swim? Do you ever drink tea? Do you often walk to school? A permanent state or situation: I live in the town where i was born. A fact or something which is always true: The earth goes round the sun. An activity that happens regularly or occasionally: He gets up at six o’clock every day. A temporary situation: I’m living with my uncle while they are painting our house. An activity happening at the present moment: I’m sorry you can’t talk to her at the moment. She is having a shower. An activity in progress but not exactly at the present moment: I am studying three foreign languages, so i am quite busy nowadays. A situation which is changing or developing: Lots of people are coming to live here, so the town is growing quickly. Things the speaker finds strange or annoying, with always. (this is away of complaining): You are always using the telephone. Our phone bill will be enormous! Something which happens frequently, with always: My girlfriend is always cooking me special meals! Verbs which describe states, not actions, are not usually used in the continuous. Thoughts: believe, know, remember, and think. Feelings: like, hate, want, need, and prefer. Senses: smell, taste, hear, and see. Possession: have, belong, own, contain, and include. Existence: exist contain, consist, seem, mean, and matter. Nouns can either be countable (c) or uncountable (u). The grammar of countable nouns is different from the grammar of uncountable nouns. Use a or an in the singular, e.g. a job, an animal. Can be made plural, e.g. cars, books. Use some and any in the plural, e.g. some friends, any answers. Do not use a or an. Cannot be made plural, e.g. work, music. Use verbs in the singular, e.g. the news is good, music helps me relax. Use some and any in the singular, e.g. some food, any advice. Armchair (n) a comfortable chair with sides that support your arms. Balcony (n) a small area joined to the wall on a high level where you can stand or sit. Bell (n) an electrical object that makes a ringing sound when pressed. Belong (v) to feel happy and comfortable in a place or with a group of people. Blanket (n) a thick warm cover that you sleep under in bed. Bulb (v) a glass object which produces light relax using electricity. Cave (n) a large hole in a mountain or under the ground. Chest of drawers (n) a piece of furniture with drawers for keeping clothes in. Consist of (v) to be formed or made of two or more things. Contain (v) if one thing contains another, it has it inside. Cooker (n) a piece of equipment to cook food. Corridor (n) a passage in a building or train with rooms on one side or both sides. Cottage (n) a small house usually in the countryside. Cushion (n) a cloth bag filled with something soft which you sit on to make you comfortable. Design (n) the way in which something is planned and made. Exist (v) to be real or present. Fridge (n) a large container that uses electricity to keep food cold. Guess (v) to give an answer or opinion about something without having all the facts. Improve (v) to get better or to make something better. Include (v) to have someone or something as part of something larger or more general, such as a group, a price or process. Matter (v) to be important, or to affect what happens. Microwave (n) an electric oven that uses waves of energy to cook or heat food. Own (v) to have something that legally belongs to you. Pillow (n) a soft object which you rest your head on in bed. Relax (v) to be happy and comfortable with no problems. Remain (v) to contiue to be in the same state; to continue to exist when everything and everyone has one. Right (adv) exactly in a place or time. Sink (n) a bowl that is fixed to the wall in the kitchen or bathroom where you wash dishes or your hands. Suppose (v) to think that something is likely to be true. Tap (n) the part at the end of the pipe that controls water. Tidy (v) to make a place clean and organised. Upstairs (adv) on or up to a higher level in a building. Washbasin (n) a bowl in a bathroom that water can Flow into, used for washing hands and face. Windmill (n) a building with long parts at the top that turn in the wind, used for producing power. 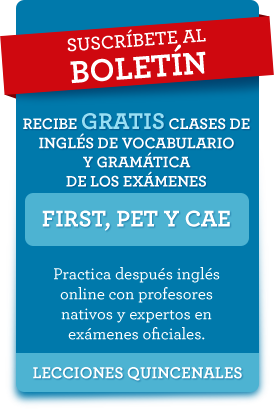 Esta entrada fue publicada en Clases de inglés gratis, Lecciones PET gratis el 11 octubre, 2013 por admin.